It’s impossible to encapsulate the experiences or learnings of such a big gathering like SEF 2016 where so many presentations and poster sessions took place. 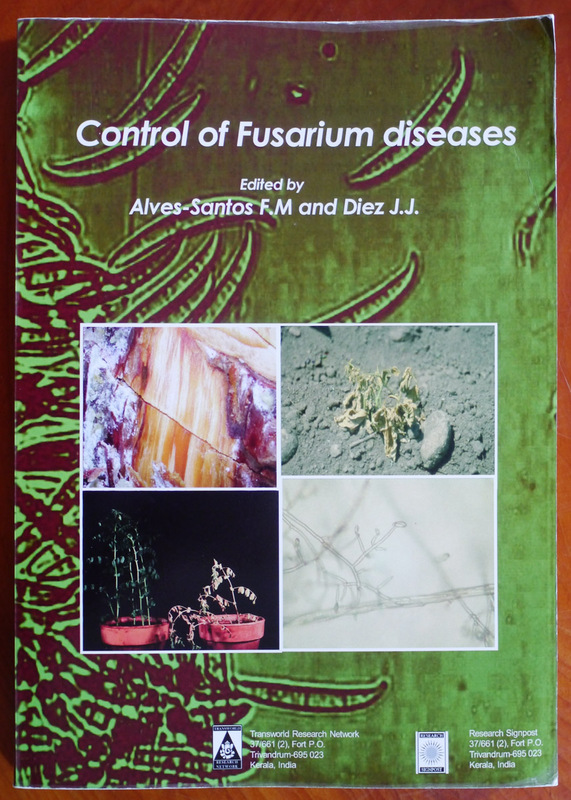 However, we were fortunate to be given a book version of the abstracts and posters presented at the conference (you can download the PDF version here), as well as an in-depth study of Fusarium disease control. Thank-you, organizers! 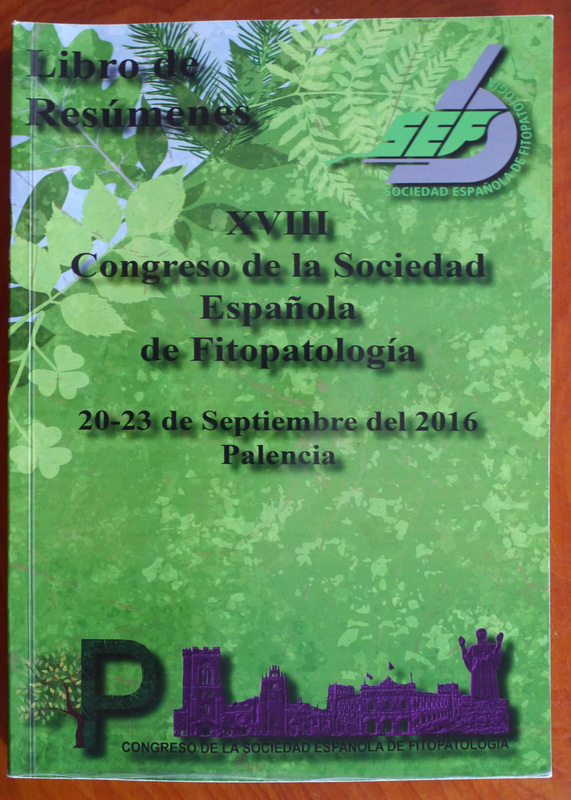 Abstracts and poster summaries from the SEF Congress. A case study available at the SEF Congress. 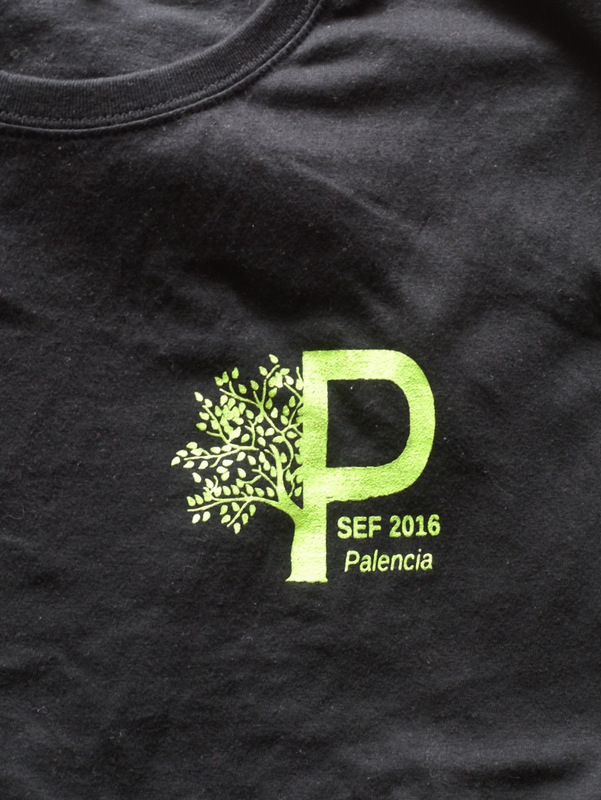 Since we design and silkscreen shirts, we couldn’t resist buying two souvenirs from the SEF Congress! 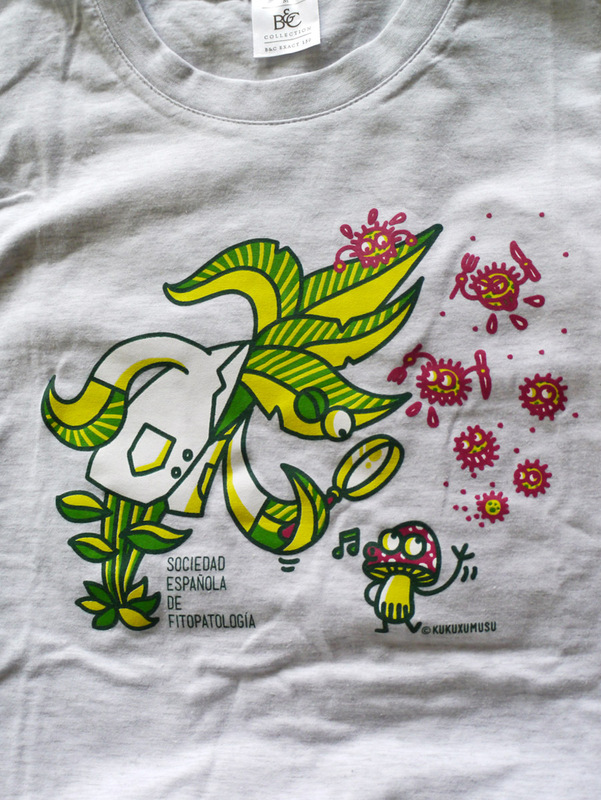 One featured a comical graphic of a scientist looking at fungi and pathogens designed by Kukuxumusu in Pamplona-Iruña; the other had the elegant Congress foliage-P graphic. Kukuxumusu design from the SEF Congress. With so many delegates attending the Congress, the organizers faced a massive job in coordinating not only the presentation and poster venues, but also the coffee breaks. 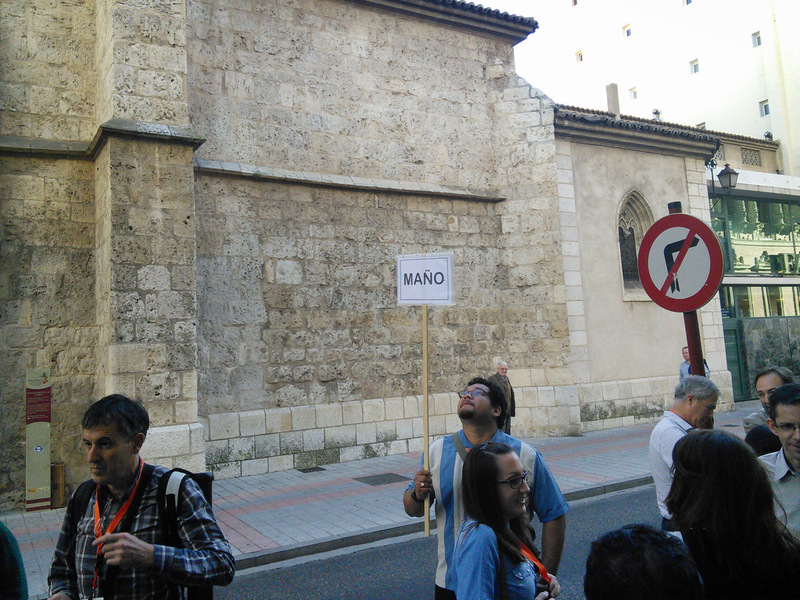 Their brilliant system assigned delegates to certain restaurants and bars downtown near the Teatro Principal. On our first morning, when we poured out onto the street for a coffee break, five people from the organizing committee awaited us, each with a sign indicating where we were going. 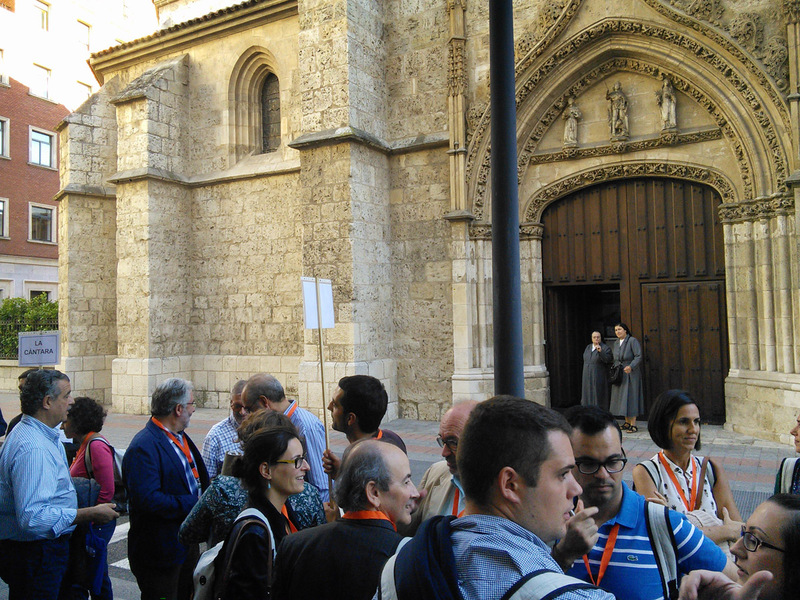 Nuns watch as SEF delegates fill the street outside the Teatro Principal. Juan Asdrubal ready to lead the way to Bar Maño! Claire and I followed Asdrubal Pacheco with the others in our group to Bar Maño (more photos on their Facebook page) where our amiable host Alberto had tables set up with coffee, juice and various snacks downstairs below his street-level bar. After that, we knew our way around! We had met Paula Zamora at the 2011 IUFRO conference in Montesclaros and were delighted to reconnect with her in Palencia. Originally trained as a forestry engineer, she has written a fascinating thesis on biological controls for Chestnut blight (she also makes beautiful enameled objects!). On our last day, after we took down and packed our exhibition, Paula kindly took us on an outing to some of her favourite places near the city: beautiful oak-covered hills, and a viewpoint from which we could see for miles across the northern Spanish plains. Claire and Paula below the oaks. Oak covered hills outside Palencia. Viewpoint near Palencia with old wine bodegas poking out of the ground. Part of the lunch Tano prepared for us. A flan-like regional specialty, super-rico. 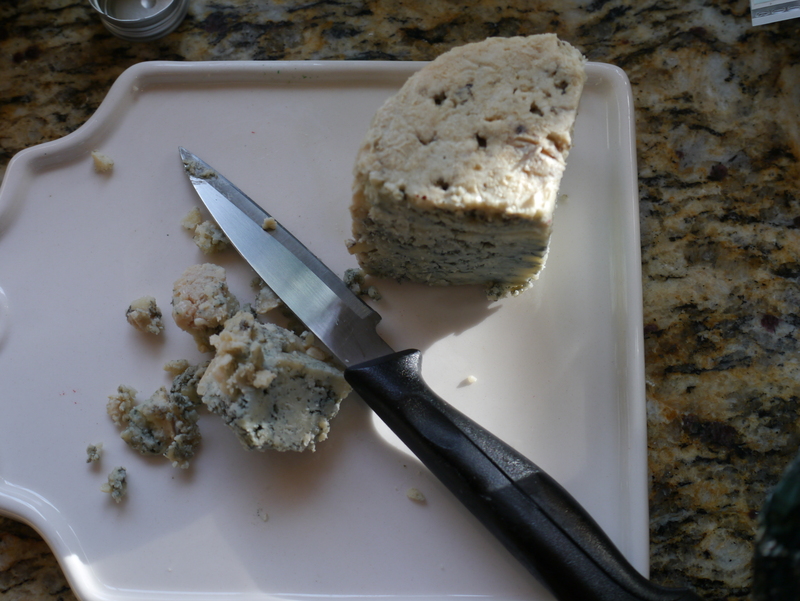 When we returned to her flat, her partner Tano, a gifted machinist, had prepared a lovely lunch for us on their patio. What a wonderful way to spend our last hours in Palencia before Paula drove us to the train station. We boarded the train to Zumarraga feeling blessed and full of the warmth of Palentino culture. After a restorative overnight in Antzuola near Zumarraga, we took a bus to Bilbao for our last evening before flying out early the next morning. After we stashed our suitcases at the pensión near the bus depot, Pilar and Oscar rendezvous’d with us downtown. They are the parents of our friend Paula Laita Pallarés’ who has been working in Williams Lake, BC. Accompanied by their mellow dog, Walter, they took us for a fantastic coffee and pastries. Claire stands beside one of the massive columns in the former wine warehouse, now a public space. People swim several stories above us in a glass-bottomed pool in the former wine warehouse. Sampling pintxos in Bilbao’s Casco Viejo with Pilar and Oscar. Pintxos bar in Casco Viejo. Mushrooms and gulas in a potato basket. On the way, we stopped into a massive building that has been converted from a wine warehouse to a beautiful public space that includes a library, gymnasium, swimming pool and exhibition/trade fair facility. Two new buildings were built inside the old one, with unique columns decorated by artists through a public art process. That was just the beginning of a delicious crawl through the old Casco Viejo part of the city with its tantalizing pintxos bars. After we were no longer capable of further culinary research, Oscar and Pilar walked us back to the neighbourhood where we were staying and said good-night. We felt very grateful for their hospitality. Susan Madsen met us at the Vancouver airport. She and Stephen Mitchell helped us recover at their house from the long trip back to Canada with their usual generosity, thoughtfulness and warmth. It was great to be able to debrief with fellow artists like them over delicious meals before starting our drive back north to Wells and returning to our various fall projects. Reminiscing about Ribera del Duero with Susan and Stephen while sampling a gift from Juan Barbé. 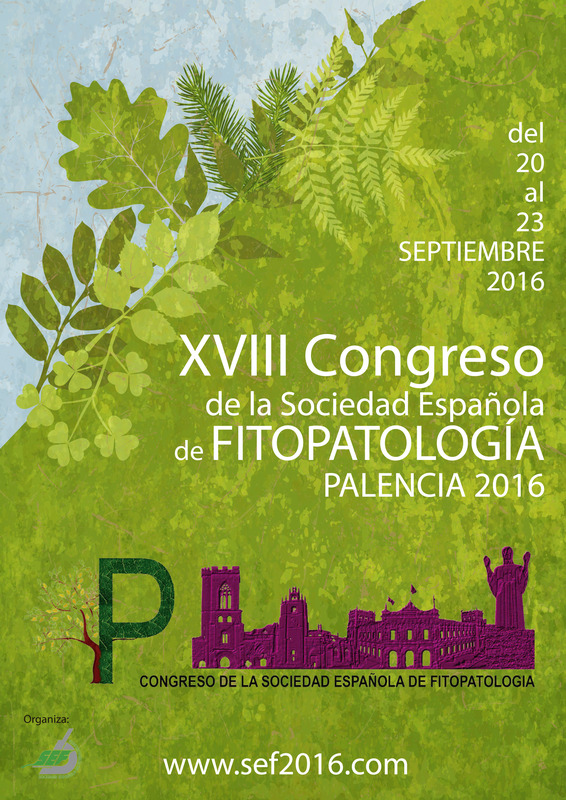 This entry was posted in España, SEF2016 and tagged Spain, Travel. Bookmark the permalink.